How many of you reading this have spent months or even years feeling like you are a terrible person, as though you are thoroughly unspiritual? You find it easy to remonstrate yourself and pick yourself apart. You have a difficult time believing that God loves you even though you are a Christian and understand what the Word says. Because all of your faults and foibles seem to you to be imposing and always before you, it is difficult for you to pick yourself up and act like Jesus or the apostle Paul would act in each situation. It is easy for you to cave into the feelings that you just aren’t amounting to anything. You try to go on, you push yourself forward and that often only makes things worse because you feel as though you are acting by simply putting on a brave face, when inside, you feel like warmed over garbage. You see other people in your church or community and you wonder why they appear to be genuinely happy or content, but for you, you can never quite reach it and those few times when you do, it is short-lived. It’s here and then gone, causing you to quickly revert back into yourself. You often feel anxious about things and life in general. You can’t really make longterm plans because you never know how you’re going to feel from one day to the next. You want to read your Bible, you want to study His Word, you want to pray and commune with our Lord and Savior, but you don’t have the energy, the strength, the wherewithal, or the ability to focus. You’re just “blah” and though you’ve tried a million and one things, nothing seems to work. You cannot get beyond the way you feel. Well-meaning Christians have said they will pray for you and they do. Others have indicated that it might be a “spiritual” problem that has yet to be diagnosed. That only puts you more into a funk until you feel as though you’ll never find the answer to the problem. You’ve tried hard to believe His Word and the promises found therein, but to little avail. You finally resign yourself to believing that you will go through the rest of your life with this “spiritual” problem and in spite of it, you will learn to lean more heavily on Him for strength. Maybe, one day, you’ll be free of it. But what if the problem is not spiritual at all? What if the problem is not spiritual, but physiological? What if the malaise you’ve been experiencing for days, weeks, months, or even years has nothing to do with your spiritual relationship with Jesus at all and has far more to do with the deficiencies your body is experiencing due to a lack of things that keep you from experiencing better health? Today, I received an update prayer list email from folks at church and I’m amazed at how many people have physical ailments that seem to be completely unresponsive to medical intervention. It is maddening, yet it is a growing concern in society. Several serious situations exist and began over the past four to five decades that have made this situation intolerable. What makes it even worse is that most of the medical community refuses to acknowledge it and why is that? It is largely due to the stranglehold that the pharmaceutical companies have on the medical field. What do you personally know about Niacin today? If you’re like I was, probably not much. You aren’t aware that Niacin is made in our bodies, that we need a good amount of it (far more than the Recommended Daily Allowance or RDA), to gain and maintain our health. It has been proven that Niacin has the ability to heal and/or cure many health problems, but why aren’t we hearing about this more? Simply put, because the pharmaceutical companies constantly run ads in medical journals to highlight their patented line of prescriptive medications. Does it not stand to reason that if a person is seriously deficient in a particular vitamin or mineral, no amount of prescription drugs are going to actually fix the problem? In fact, the easiest and quickest way to fix things is by bringing the person up to speed on the vitamin/mineral they lack. Does this not make sense? But for too long, the medical community has poo-poo’d the idea that vitamins can actually heal. The general consensus is that vitamins can only maintain good health and in unusually small doses as well. Is this true? Not according to medical doctors like Abram Hoffer and numerous others since the early 1900s. But by and large, these professionals and specialists are shoved to the side. Even though there are warnings about taking too much of a quantity of vitamins, there have been no reported deaths from taking mega-doses of vitamins. So what is the problem? Why are people dying of things that it would seem proper nutrition (from food and vitamin supplementation), could easily address? The problem is once again the stranglehold that the pharmaceutical companies have over the medical industry. The authors of Niacin: The Real Story then went on to list the many journals that had the most negative articles about vitamins and at least seven were listed. There appears to be an all-out attack on supplementation by the pharmaceutical industry. Consider Niacin (B3). This is actually made in our bodies and appears naturally in nature. It cannot be patented because God created it. The pharmaceutical companies have been desperately trying to create their own version of Niacin once they learned that this vitamin helps greatly with high cholesterol. However, today’s statins are very dangerous and come with many side effects and warnings. Niacin does not. 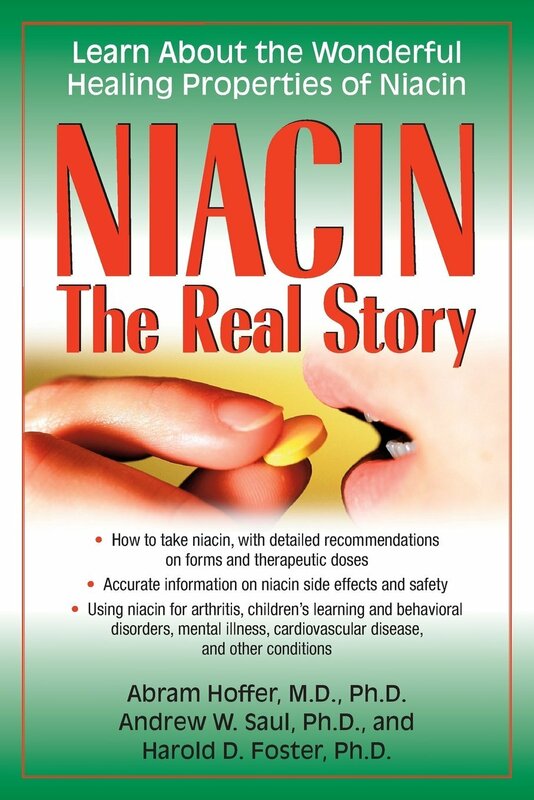 The authors of the book I’ve been quoting have noted the research done either by themselves or other doctors since the very early 1900s and have noted that mega-doses of Niacin have helped a plethora of physical issues in people, not least of which is increasing good cholesterol and reducing bad. But Niacin – plain old Niacin – is very inexpensive compared to the statin drugs that the pharmaceutical companies push. Niacin has also shown great efficacy in treating schizophrenia but at very high doses (approximately 30,000 mg/day spread out over three doses). The average person reading this will go, “WHAT? !” That’s crazy! Isn’t Niacin TOXIC at that level? !” No, it isn’t. Niacin has also proven its mettle when dealing with powerful addictions like alcohol or drugs. The problem with these types of addictions is that an alcoholic is trying to put something back into his/her system that is missing. The high content of sugar in most alcohol provides some relief but destroys as it goes. It is a vicious cycle that ends up killing the alcoholic if nothing is done. Mega-doses of Niacin have been proven to be effective in treating this problem, but it is not widely disseminated information. Again, why? Pharmaceutical companies. In 2012 a “study” was done on the effects of adding high-doses of Niacin to a statin for people with high cholesterol. The results were not good so the blame was placed squarely on the Niacin. The statin received no blame at all, but was quietly removed from the market. Interestingly enough, the Niacin used was not plain Niacin, but a form of extended-release Niacin that the pharmaceutical companies had created. Some would argue that the study was done to place Niacin in a bad light. I’d like to recommend two books that I believe not only every person but every Christian needs to read, absorb, and put into practice on a daily basis. It’s your health that may be at stake here. You can continue to listen to the pharmaceutical companies who have brainwashed many in the medical community away from vitamin supplementation or you can strike out on your own and see if there is something within the field of supplementation that may actually help you achieve optimal health. Since the early 1900s, our food supplies have been consistently reduced in vitamin-fortified substances. Today’s overly processed foods have to have vitamins added back into them (“enriched”), yet it would seem that this is not nearly enough and if one considers the way people eat today, it becomes clear that people are not getting enough actual nutrition on a daily basis that would allow their bodies to do what they’re designed to do. You have the power to change the way you feel physically, mentally, and emotionally. Doesn’t it stand to reason that if you are deficient in certain vitamins and/or minerals, your body will tell you about that by allowing illnesses to come to the surface? Doesn’t it then also make sense that the best antidote for such maladies is the reintroduction of the missing vitamins/minerals in the proper dosages? Today, we have the means to actually be healthy, in spite of the overly processed foods that the food companies are spitting out at us. We have the ability to take the bull by the horns and determine the state of our own health. I am now convinced that it starts (and often ends) with the right vitamins in the correct dose. If you are a Christian and believe you are suffering from “spiritual” problems that you need to work through, might I suggest that your “spiritual” problems might be nothing more than vitamin deficiencies that have created a general malaise (including but not limited to depression) that neither you nor your doctors can identify? As a result, they simply have you on several medications to treat the symptoms that they see in you, but they are not solving the problem. If you value your health, then you owe it to yourself to start investigating an area that most of the medical community ignores: vitamin supplementation. Most vitamins are fairly inexpensive and pharmaceutical drugs are not. The pharma industry knows this which is why they have to work very hard to convince doctors and consumers that vitamins cannot heal and only powerful drugs can do that. I myself have begun a rigorous vitamin regimen and I will let readers know how things are going. So far, it’s been one week and I have already noticed some benefits. Before you say “ah, that’s the placebo effect!”, I’ll ask you to reconsider that. Do you not count yourself out of the arena of good health. Get the two books listed above, read through them, make notes, ask questions, and put at least some of the recommendations into practice. Like me, you may wish to start with adding Niacin to your daily intake and go from there. Understand that there is plenty of actual scientific evidence to support the conclusions drawn by the authors of these books. Is it worth your time to be healthy? Entry filed under: Agenda 21, Atheism and religion, christianity, Cultural Marxism, Demonic, Emotional virtue, eternity, Political Correctness, Politically Correct, Politics, Religious - Christian - End Times, Religious - Christian - Prophecy, Religious - Christian - Theology, salvation, second coming. Tags: abram hoffer md, andrew w saul phd, big pharma, chronic degenerative diseases, good health, megavitamin, niacin, niacin b3, otrhomolecular medicine, pharmaceuticals, statins, vitamin deficiency, vitamins, vitamins and minerals.